Enjoy the secluded rural setting of our cottage, nestled amongst the trees and surrounded by beautiful rolling farmland, overlooking a beautiful lake and old English stone bridge. A leisurely walk to the Restaurant, Winery and Gallery at Lamonts, and only 3 minutes to Smiths Beach, 5 minutes to Yallingup, 10 minutes to Dunsborough and 20 minutes to Margaret River. Snuggle up to the wood fire with a good book or relax on the verandah with your favourite bottle of wine and soak up the views, wildlife and atmosphere. The cottage is a beautiful weatherboard, which has now been fully renovated and furnished to a high standard. Crisp white linen, towels and tea towels are included in the price. There is a lovely kitchen, high ceilings, polished jarrah floor boards and wood fire. French doors from both the lounge and main bedroom open up to the beautiful verandah which wraps around on three sides with wonderful views in every direction. Wake up in the morning and gaze out over the lake to the beautiful bridge. Fully self contained with three bedrooms, kitchen, dining, lounge, bathroom and laundry. Bedroom 1 has a queen size bed, bedroom 2 has a double bed and the third bedroom has 2 single beds. The verandah has been extended providing a large outdoor entertaining area with barbeque and outdoor furniture. 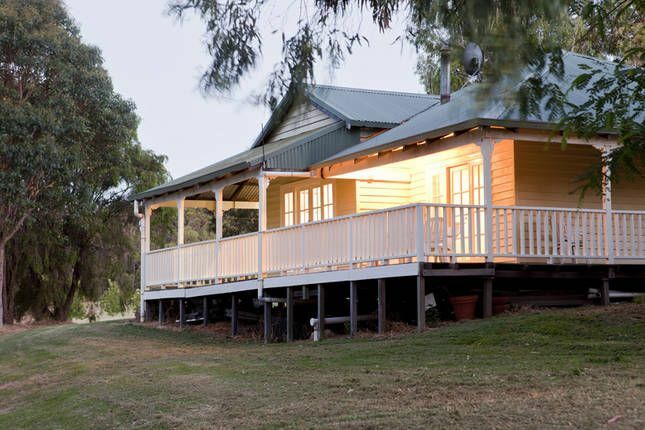 Children are well catered for with a safe verandah and plenty of space outside for their favourite ball game. Wildwood Brook Cottage is one of 5 privately owned cottages spread out across 15 acres overlooking the valley. Please Note, unfortunately due to strata regulations we are unable to accept school leavers. The cottage is in the heart of the South Wests famed Wine Region close to Yallingup, Smiths Beach, Dunsborough and Margaret River. There are nine wineries within a 10 minute drive, including Amberley, Rivendell and Lamonts. All the Southwest has to offer is on your doorstep. From Wildwood Road, turn north onto Millbrook Road then take the first right into Wildbrook Place. Wildwood Brook Cottage is the second cottage. Millbrook Road is 1km from Caves Road and 15kms from the Bussell Highway. Wineries, restaurants, beaches,snorkeling, surfing, caves, art and furniture galleries, shearing shed, potteries, ice creameries, chocolate factory, golf, archery, mini golf, Yallingup, Dunsborough, Margaret River, the South West. Bookings less than this are fine when filling gaps that may arise, however a 2 night minimum will always apply. This deposit is fully refundable up to 6 weeks before the commencement of the booking. Full payment is due 2 weeks prior to the commencement of the booking. Our third stay - feels like home. Owners are great. We always have a wonderful time when we visit Wildwood Brook Cottage. We had some rain this time and an issue with the lights going out after some water got in, but the owners were brilliant in getting the electrician straight out. Problem sorted in no time. Thank you so much for your patience with the problem when the outside security light got wet due to the heavy rain. Always a delight to host you and your family and we hope to see you again soon. We loved our stay at Wildwood Brook Cottage. Perfectly located a short drive away from Yallingup and Dunsborough, it was a great base from which to plan our daily adventures. The weather was too warm to justify lighting the fire but I'm sure it would be absolutely gorgeous on a cold winter evening! The cottage contains everything you might need for a comfortable stay and is very clean. We couldn't get the WiFi working but that was the least of our worries as we enjoyed gin and tonics on the back verandah while taking in the view. Our kids absolutely loved the friendly kangaroos who visited each night and were entertained daily by the pink and grey galahs on the bird feeder. We would highly recommend Wildwood Brook Cottage for a family get-away or as a grown-ups-only retreat from the rat race. Thank you for a lovely stay at Wildwood brook cottages, great location. Feels like home. Our second stay was just as wonderful as our first. Wildwood Brook Cottage brings much joy to our family of four. We will definitely be back...again! This is a lovely cottage with everything you'll need for a comfortable stay.